Such was the case with the Sept. 13, 1862 Battle of Charleston, a day-long artillery duel and series of firefights that left 43 men dead and 179 wounded, a number of downtown buildings in flames, and most of the town’s 1,500 residents temporarily in flight. Confederate forces were confident and on the attack in the weeks leading up to the battle. Gen. Albert Gallatin Jenkins, who grew up on his family’s Green Bottom plantation in Cabell County, led a cavalry raid across the mountains of what is now West Virginia, starting from Monroe County and briefly crossed into Ohio before returning to Buffalo on the Kanawha River, 30 miles downriver from Charleston, on Sept. 9. Just before Jenkins began his raid, Union Gen. Jacob Cox led a force of 5,000 federal troops out of the Kanawha Valley to aid in the defense of Washington, D.C., leaving an equal number of soldiers behind to protect the valley from a Confederate raid on the salt works east of Charleston. The 5,000 federal troops left behind under the command of Col. Joseph Lightburn, an officer with no battlefield experience, were believed by Lightburn to not be up to the task of stopping the 8,000 to 10,000 men led by Confederate Gen. William Wing Loring, who arrived on the outskirts of Fayetteville on Sept. 10, and immediately began pushing the federal force back down the Kanawha toward Charleston. Despite constant pressure from Confederate skirmishers and the demands of keeping an 800-wagon supply train moving, Lightburn managed to lead an orderly retreat past Gauley Bridge and Montgomery, stopping to load up what supplies remained at the Union encampment at Belle before setting it ablaze and continuing toward Charleston. As the federal soldiers marched past the salt works at Malden, a number of them paused long enough to roll barrels of processed salt into the Kanawha River, while others burned two of the largest salt furnaces that could be seen. An Ohio newspaper reporter watched as slaves put down their burdens and walked away from still-running salt processing machinery to join the march to Ohio and freedom. The first Union soldiers began arriving in Charleston shortly after daybreak and began building barricades from fence rails in the pastures and firing positions in the cornfields that made up the East End at that time. Although it was late summer in the Kanawha Valley, many soldiers were wet and cold from the rain showers they marched through during the night. Col. Lightburn had warned citizens of the coming battle and advised them to leave town. Many of them traveled only as far as Cox’s Hill, site of the present-day Spring Hill Cemetery, while others followed the Union wagon train or joined an armada of flatboats, skiffs, rafts and canoes in the Kanawha River carrying citizens and slaves on a three-day float to Gallipolis on the Ohio. Cannon fire broke out from federal batteries on both sides of the Kanawha as Confederate soldiers began swarming into the sleepy river town. Confederate artillerymen later returned fire from batteries set up near the present-day University of Charleston and from the heights of Fort Hill. Among the first Confederate elements reaching the town were members of Co. H of the 22nd Virginia Infantry, drawn mainly from the ranks of the former Kanawha Riflemen, a unit formed in Charleston before the outbreak of war. For some members of the 22nd and its commander, Col. George S. Patton, a Charleston lawyer and grandfather of the World War II General of the same name, the Battle of Charleston would offer them their last look at their hometown. By midday, the battle had moved to the downtown area, where federal troops worked furiously to load supplies from temporary warehouses into wagons as the Southern troops approached. On Lightburn’s orders, the Charleston Branch of the Bank of Virginia, the Kanawha House hotel, the Mercer Academy and several other stores and homes filled with supplies that could not be carted away in time were torched. After crossing the Elk River on a cable suspension bridge near present-day Washington Street, federal troops cut the span’s suspension cables and burned its deck, then set up firing positions in a field facing the Elk in what is now Charleston’s West Side. Firing continued until dusk, and then broke off, after Loring opted to occupy the newly won city for what turned out to be less than one month instead of pursue the Union force. “Never again in the course of the war would the Kanawha Valley be seriously threatened by any Confederate force,” Lowry wrote. 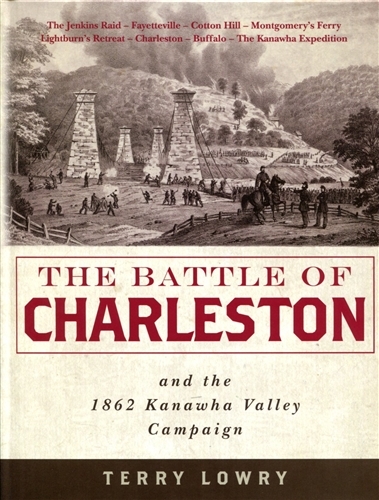 The Kanawha Valley Campaign of 1862 “has become one of the most neglected episodes of the Civil War,” according to Lowry, possibly because it happened at about the same time as the bloodier Battle of Antietam, which received immediate national attention. Now that 154 years have passed since the Battle of Charleston and the campaign that preceded it took place, “it is beyond time that it is given its due,” Lowry wrote. Lowry unearthed hundreds of photographs, maps and drawings to illustrate his 479-page, $34.95 book, which includes extensive casualty lists as well as post-war biographical sketches of many of the battle’s key veterans. “The Battle of Charleston and the 1862 Kanawha Valley Campaign” was produced by 35th Star Publishing.